HMD Global unveiled a trio of premium metal-bodied smartphones and one gimmicky feature phone at its MWC 2018 press conference, and sandwiched between them was also the Nokia 1. Part of Google's Android Go initiative, this is a smartphone that aims to redefine the low-end of the market. The Nokia 1 could bring all the features and benefits of Android to buyers who have never been able to afford a smartphone, but it will have to be priced very well in order to do that. HMD Global will be competing with several other companies launching extremely similar Android Go phones over the next few months. The Micromax Bharat Go and Lava Z50 also launched just recently, and both look extremely similar. Thankfully the Nokia 1 stands out from both of them in terms of design. Of all the Nokia phones have released since the comeback, this one looks the most like its colourful older models. That's largely due to its size and proportions, but also the swappable, colourful rear shells, called Xpress-on covers, another throwback to the heydays of Nokia. There's a white plastic border that separates the phone's black front face from whatever colour your cover is, giving the Nokia 1 a Lumia-style two-tone look. The Nokia 1 will be sold in either a bright red or a deep blue, but there will be multiple Xpress-on covers for you to choose from as well, including grey, pink, yellow, and light blue. The phone's body is thick but rounded, and feels very comfortable in the hand. Pop the cover off and you'll see a removable battery as well as the SIM and microSD card slots. The screen measures 4.5 inches and has a resolution of 480x854 pixels. Unlike its counterparts, HMD has chosen to use on-screen Android navigation buttons which means less space for content in some cases. There's a 5-megapixel rear camera with a flash, and a 2-megapixel front camera. With 1GB of RAM and 8GB of storage, we can tell that this phone will be positioned a step above Lava and Micromax's offerings. The UI is stock Android, in this case Android 8.0 Oreo Go Edition. HMD Global has gone all in on the Android One programme so all its phones should receive updates and security patches quickly. The Android Go suite of apps, including Gmail, YouTube and Maps should also help buyers make the most of their limited storage space and consume less mobile data, which are bound to be good things. Performance wasn't perfectly smooth and there was a little bit of lag when using the Nokia 1, which was to be expected. We'll have a detailed report of performance, including the cameras and battery life, when HMD launches this phone in India this April. HMD Global has announced an international price of $85 which comes to roughly Rs. 5,500 before taxes. At that price, it will be hard to justify not spending a tiny amount more for a much more powerful and versatile phone such as the Xiaomi Redmi 5A (considering its official Rs. 5,999 price tag, though it currently sells for only Rs. 4,999 as part of an introductory offer). Nokia might have gotten the look and feel right, but this pricing means that it isn't chasing the same goal as other Android Go devices. It will appeal to those who are reassured by the Nokia brand and want a simple no-frills phone. 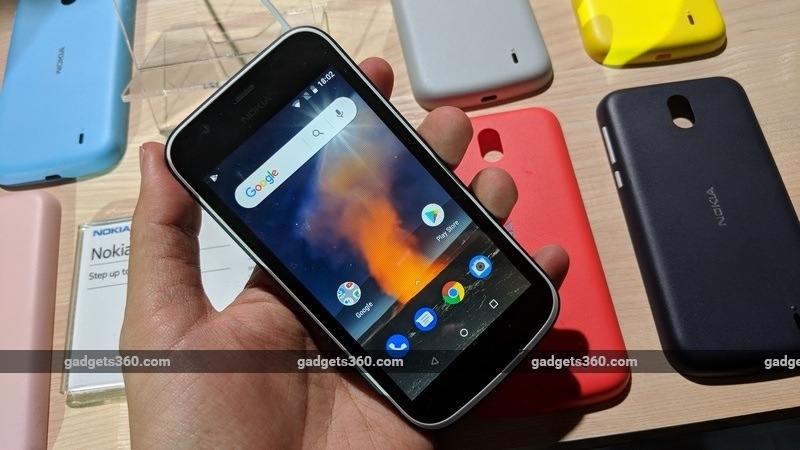 product Nokia 1 is among the few Android Go smartphones announced so far, and will be launched in India in April.